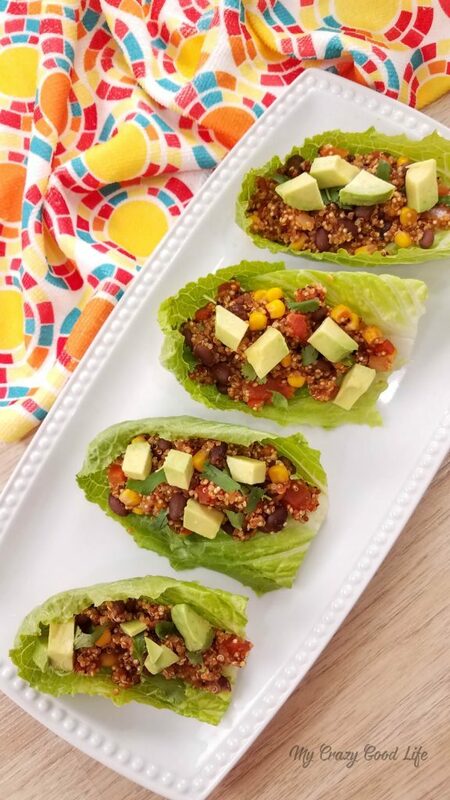 For those of you trying to cut back on meat, enjoy meatless Mondays, or just looking for a delicious dinner idea, these Quinoa Tacos are Vegan and so delicious. Cooking the taco filling in the Instant Pot makes for a super easy dinner. If you don’t own a pressure cooker, it’s ok! These can also be made on the stove or even in the slow cooker! We love eating this meal for Meatless Mondays or when we just want to skip the meat for a night. I love the protein that quinoa has in it, and it adapts so well to different seasonings! 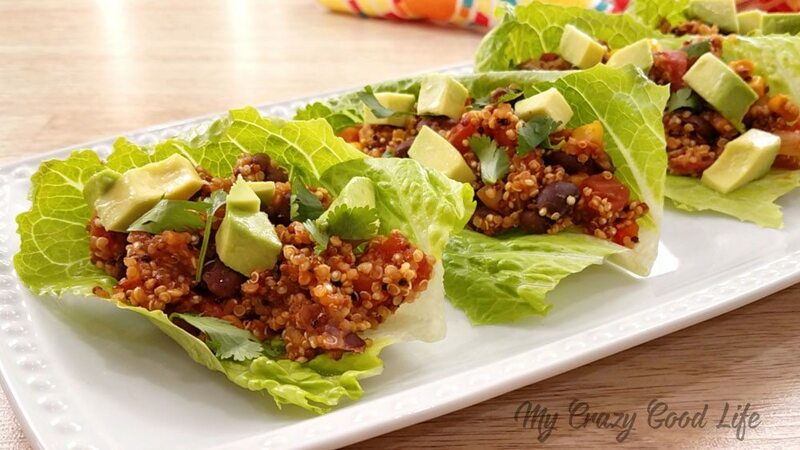 The lettuce wraps are a great way to get more veggies in, too! I usually double up on them so if one cracks or breaks, the taco filling won’t fall out! 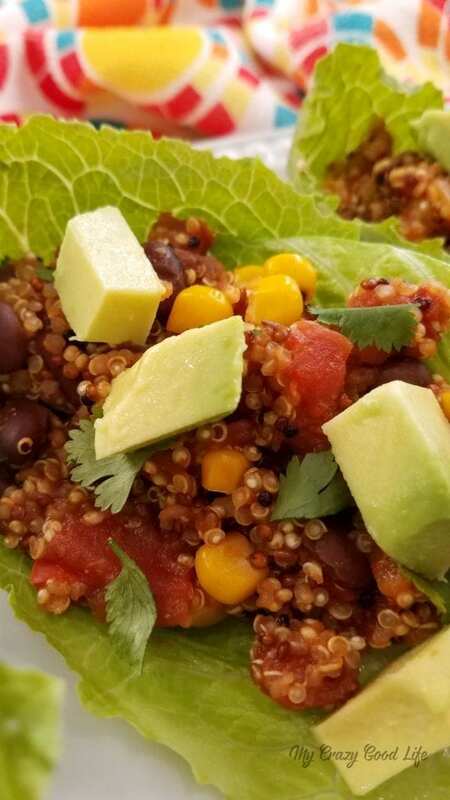 This hearty quinoa is the perfect vegan filling for tacos. It’s super easy to cook and with the black beans added, I swear you won’t miss the meat! The diced tomatoes with jalapeños is a great addition to give the taco filling some kick. Homemade taco seasoning rounds out this delicious meal. You can easily use this taco filling as a salad topper, a stuffing for bell or mini peppers, or even on a baked potato! 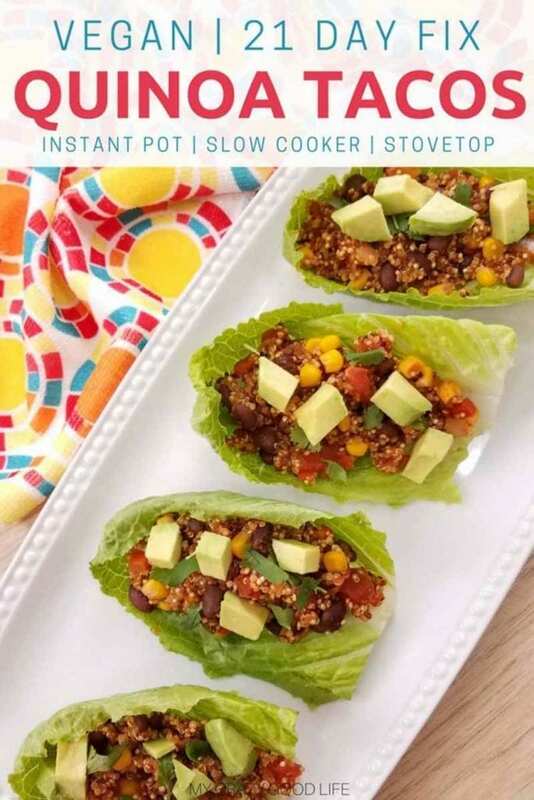 I love eating the quinoa taco filling with lettuce as shown in this post, but it’s so versatile! 1. Turn the Instant Pot to saute. Add the oil. When it is hot, saute the onions, garlic, bell peppers, and quinoa until fragrant (about 1 minute). 2. Mix in the rest of the ingredients. Close the lid and turn the pressure valve to sealing. Cook on high pressure using the manual or pressure cook button for 1 min. Let the pressure release naturally. 3. Turn off the Instant Pot, remove the lid, and let cool. There will be a little liquid left, but it will absorb as the filling cools. Let cool about 5-8 minutes, and then fill your wraps, garnish, and serve. 1. Grease the slow cooker insert with the olive oil. 2. Mix all the ingredients together in the slow cooker (minus lettuce, avocado, and cilantro garnish). 3. Add the lid and let cook on high for 3-4 hours. Turn the slow cooker off, give it a quick stir, and let cool for 8-10 minutes to allow any excess liquid to be absorbed. 4. Assemble, garnish, and serve. 1. Mix all the ingredients together in a large skillet or stock pot (minus lettuce, avocado, and cilantro garnish). 2. Bring the quinoa to a boil using high heat then reduce to medium-low heat. Cover the pan and let cook for 15-20 minutes, stirring occasionally. 3. When the water is absorbed and the quinoa is tender and translucent, turn the stove off. Allow to quinoa to rest for 5-10 minutes to cool. Assemble to wraps, garnish, and serve. 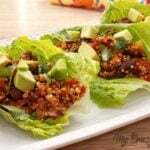 These Quinoa Tacos are the perfect vegan taco recipe! Make these in the Instant Pot, Slow Cooker, or on the Stove. 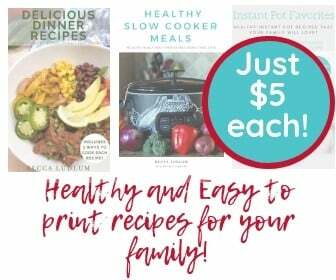 Whether you're looking for a meatless Monday recipe or just a vegetarian taco recipe, these are a great family friendly meal. 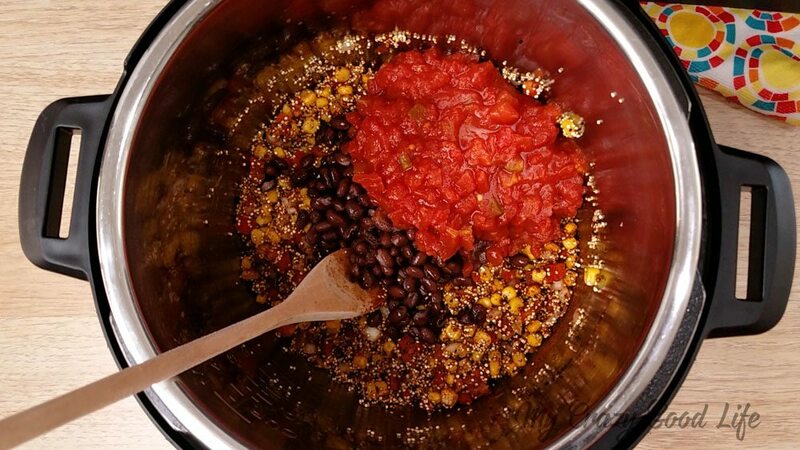 Quinoa and black beans make for a filling taco recipe! Turn the Instant Pot to saute. Add the oil. When it is hot, saute the onions, garlic, bell peppers, and quinoa until fragrant (about 1 minute). Mix in the rest of the ingredients. Close the lid and turn the pressure valve to sealing. Cook on high pressure using manual for 1 min. Let the pressure release naturally. Turn off the Instant Pot, remove the lid, and let cool. There will be a little liquid left, but it will absorb as the filling cools. Let cool about 5-8 minutes then fill your wraps, garnish, and serve. Grease the slow cooker insert with the olive oil. Mix all the ingredients together in the slow cooker (minus lettuce, avocado, and cilantro). Add the lid and let cook on high for 3-4 hours. Turn the slow cooker off, give it a quick stir, and let cool for 8-10 minutes to allow any excess liquid to be absorbed. Mix all the ingredients together in a large skillet or stock pot (minus lettuce, avocado, and cilantro). Bring the quinoa to a boil using high heat then reduce to medium-low heat. Cover the pan and let cook for 15-20 minutes stirring occasionally. When the water is absorbed and the quinoa is tender and translucent, turn the stove off. Allow to quinoa to rest for 5-10 minutes to cool. Assemble to wraps, garnish, and serve. If you choose to make the recipe without corn, yellow reduces to 2Y per serving. Thank you so much for posting this yummy dinner recipe! I am a bit confused with the calories and nutritional info per serving. Is it 80kcal per 1/4cup of the mixture, or do 3 filled wraps equate to 80kcal? I’m currently calorie tracking my food so I would sincerely appreciate some clarification whenever you have a chance!